Coffee powers the thinking of a lot of the world and Keurig provides popular tools for this crucial beverage! The Keurig K55 Coffee Maker is a versatile tool that allows users to brew several single cups before refilling the reservoir. Discover why this popular Keurig model is still one to consider for your morning brew in the following Keurig k55 review. Already decided? See the difference between the Keurig K50 vs K55. The pod puncturing mechanism on a Keurig is a great feature. The process of placing the pod and powering up the machine punctures the cup of coffee. This mechanism is universal to all varieties of Keurig Coffee Makers. Be aware that the puncturing needle that pokes through the pod foil and accesses the contents can get clogged and need cleaned. The process of descaling your Keurig should include cleaning the needle. Be aware that if you use your machine for sweet beverages such as hot cocoa or apple cider, the needle may need cleaning more often to clear away any sticky residue. The Keurig display is easy to read and can tell you from a distance if they power is on or off; the cup size buttons feature a blue backlighting that's highly visible. The Keurig K55 button sizes are well placed but not terribly intuitive. While the cup sizes are fairly obvious as displayed, all the brewing buttons are the same size. Since there are only three, only the sleepiest coffee fan should have real trouble. The display will also let you know when you need to add bottled water and when to descale your machine. Once you power up your Keurig you will have to wait a bit before brewing; the "heating" light will come on until the water is at the right temperature. On some newer Keurigs, the auto shut off feature is automatic. However, the K-55 from the Keurig classic series has that selection as an option. The days of scorching your coffee as it sits on the burner are over, but if your Keurig is left constantly on and the water is always kept at a brewing temperature, you may find that your machine requires descaling more often. Leaving the water hot for extended periods of time increases evaporation and adds to the mineral solids that build up and cling to the seals, gaskets and heating plates of your Keurig coffee pot. If the timed auto shut off is an option on your display, use it. Your machine will last longer and be less likely to require frequent descaling. It's important to note that everyone's water supply is different; when possible, filtered water is strongly recommended for your Keurig. No Keurig k55 review would be complete without agreeing that, yes, at the end of the brewing cycle, these machines can be noisy. Think of them as sort of a trade-off; a drip coffee pot makes a bit of noise throughout the dripping process, while a percolator chugs on for a time as well. French press and pour over coffee requires you to fire up the tea kettle in the morning, which may or may not be noisy. However, the final wheeze as a Keurig expels the last drop of coffee can be a bit disturbing. You may worry that your machine is failing, but it's only working hard on your behalf. Once you get used to it, you'll barely notice the noise. Be aware that if you're brewing a tall cup of coffee, you may lose a lot of heat in the brewing process. While a standard drip pot will often brew into a heated or thermal carafe, the Keurig 55 brews into an open cup. The longer the top layer of coffee is exposed to room temperature, the cooler your coffee will be. Can you override the water temperature governor? Probably. Should you? No. Safety should be the primary concern. It's unwise to alter the water temperature of your Keurig. Keurigs are quite flexible! With the right pods, you can choose from a variety of Keurig flavors such as hot cocoa, apple cider or chai tea. As previously stated, you can prepare any number of beverages with your Keurig. One of the big positive factors of using this machine is that you can produce single servings of unique hot beverages for guests. One of the more negative factors is that you can only produce one cup at a time. However, there are a wide variety of tools and flavor pods available for Keurig users. Many pod manufacturers offer their beverage concentrates under a variety of brands, but nearly all are Keurig compatible. 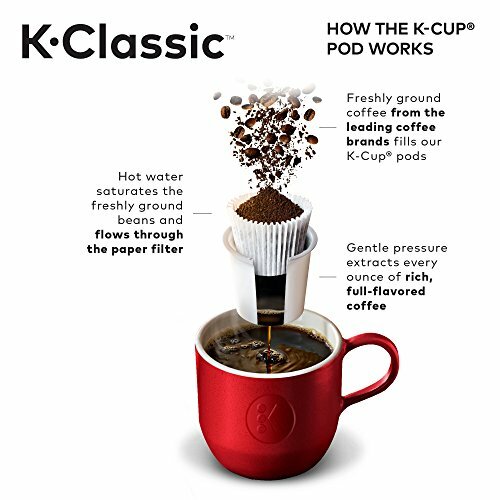 Keurig has its own descaling product and offers detailed instructions on how often to descale and what filters to remove. It's important to remember that Keurig coffee pots hide water; the reservoir is just that, a reservoir. When your Keurig is preparing your morning coffee, it's actually filling your cup with water from inside the machine. Water from the reservoir is then drawn down to fill the water tank inside the pot. When you run your descaling, be certain to follow all Keurig K55 manual instructions. You'll want to pull any water filters currently inside the machine. Use the descaling liquid as directed by Keurig, and be absolutely certain to complete all rinsing as required. You need to clear both the reservoir and the internal holding tank. There is a replaceable Keurig K55 filter in this coffee pot. Authorities with Keurig strongly recommend replacing this filter every two months. It's important to keep an eye on this filter schedule; impurities and excess minerals can ultimately damage your coffee pot. Occasionally, an industrious cafe au lait fan will pour milk into the Keurig in an attempt to brew coffee with steamed milk, or to prepare a lush cup of hot cocoa. Woe to the next person who tries to use the pot! As previously stated, there are filters inside many Keurigs and a concealed water reservoir. No matter how many times you rinse and empty your water fill jug on the side of the Keurig, you will only be diluting the milk mixture inside your Keurig. You will need to drain your Keurig completely before it's safe to continue to use it. This milk mixture will do what milk does with time and heat; it will curdle, burn and reek. If you suspect that someone has brewed milk in your Keurig due to the rank odor coming off your coffee pot, be aware that there are fixes for this tragedy. Always, ALWAYS unplug any appliance before attempting to disassemble. If you don't feel comfortable working with electronics, invest in another Keurig. The Keurig K55 may be suited best for low volume coffee drinkers in a single household. No matter your taste, you can find something hot and fragrant that you will love. Change the filters as required, descale when needed and only use water in the pot. Did you enjoy this review? 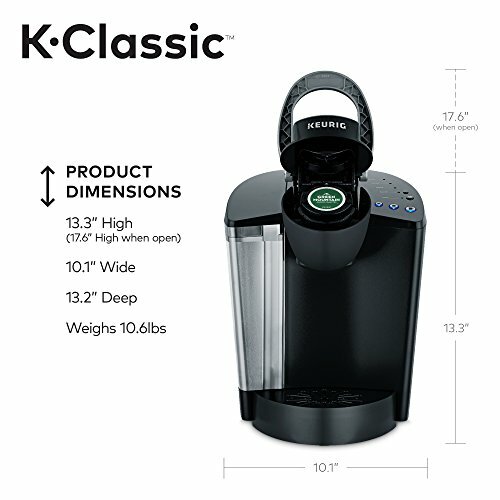 Let us know in the comments what you think of the Keurig K55 and anything you would change about it.